Saguaro National Park. The Sonoran Desert is home to the most recognizable cactus in the world, the majestic saguaro. Visitors of all ages are fascinated and enchanted by these desert giants, especially their many interesting and complex interrelationships with other desert life. Saguaro cacti provide their sweet fruits to hungry desert animals. They also provide homes to a variety of birds, such as the Harris� hawk, Gila woodpecker and the tiny elf owl. 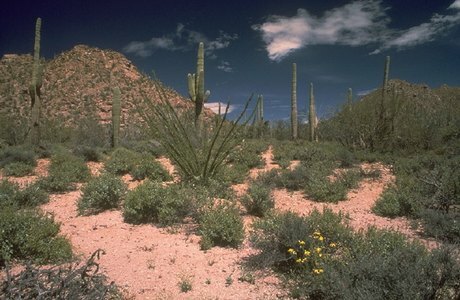 Yet, the saguaro requires other desert plants for its very survival. During the first few years of a very long life, a young saguaro needs the shade and protection of a nurse plant such as the palo verde tree. With an average life span of 150 years, a mature saguaro may grow to a height of 50 feet and weigh over 10 tons. While most visitors to Saguaro National Park choose a leisurely drive on one of our scenic loop drives, those eager for an escape from the rigors of city life often opt to explore the park on one of our many trails. With over 150 miles of hiking trails, ranging from flat and easy strolls in the Sonoran Desert to steep and rugged hikes into the Rincon Mountains, visitors of every ability have a place to get out of the car and explore.